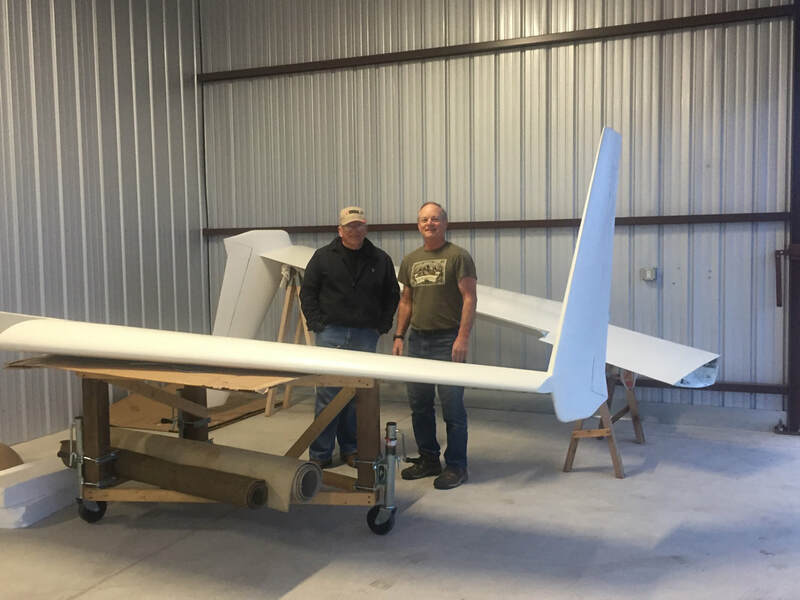 Ch 21.1 Strakes: Through "Top Hats"
This page describes the transition of project from my garage/home to the hangar, and other pages will cover work performed subsequently to get ready for first flight. Getting a hangar in the Austin area is not trivial. We're a rapidly growing metro area and with that, I guess comes prosperity and associated growth in aviation participants. I signed up on hangar waiting lists the several months after I started building in 2015 and thankfully was called in early 2018 with a hangar opportunity. I had already accepted a hangar partnership with Ben Bennett which was a much better deal for both of us, in sharing the cost and having a place where both of our projects could fit at the same time. Not all T-hangars are big enough for 2 Cozy's but ours is (just barely). I wasn't ready to move into the hangar when it became available to Ben and I, as I was still working on Ch 22 and 23 but had finished the wings, so I got them moved out (one from the garage ceiling and one from under the house), which helped give me some more working space. It also enabled me to start considering the ramifications of actually moving the project to the airport. 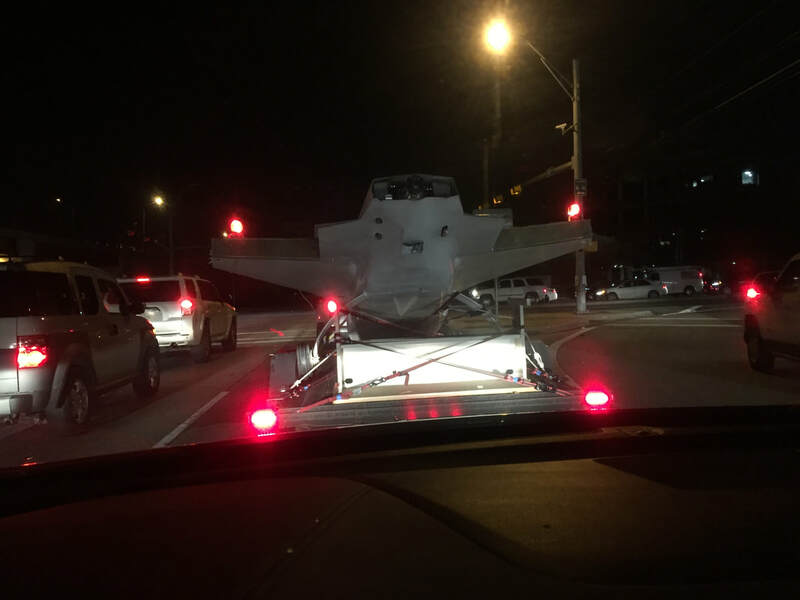 I had the wonderful fortune of truck/trailer assistance from John Nodler, with whom I work for this wing move. 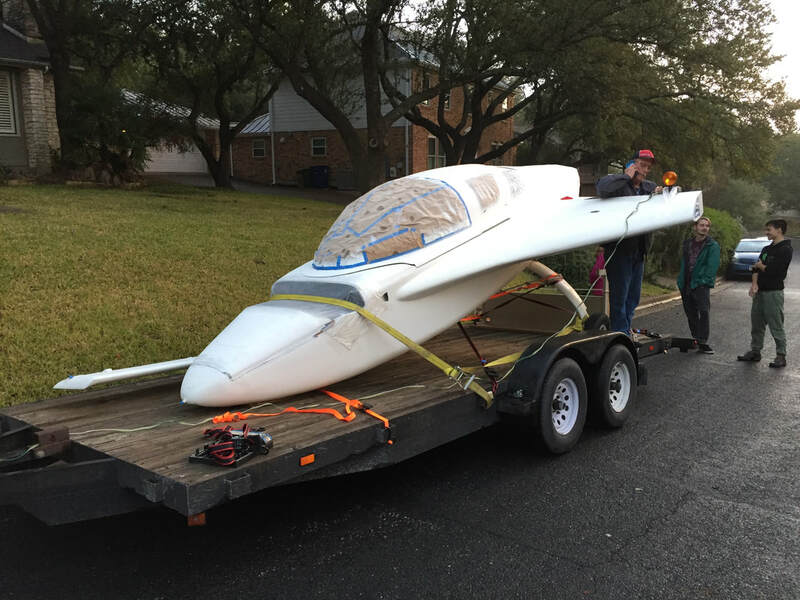 He borrowed a 22 ft flatbed trailer and given it's size, I loaded it with both wings, wing leveling jig, some saw horses and other things I didn't need at home but would be useful in the hangar. Ben met us at the hangar and we got things quickly stowed. At least it's not empty now. Hangar mates: Ben Bennett and I in the hangar with the wings waiting for the fuselage. 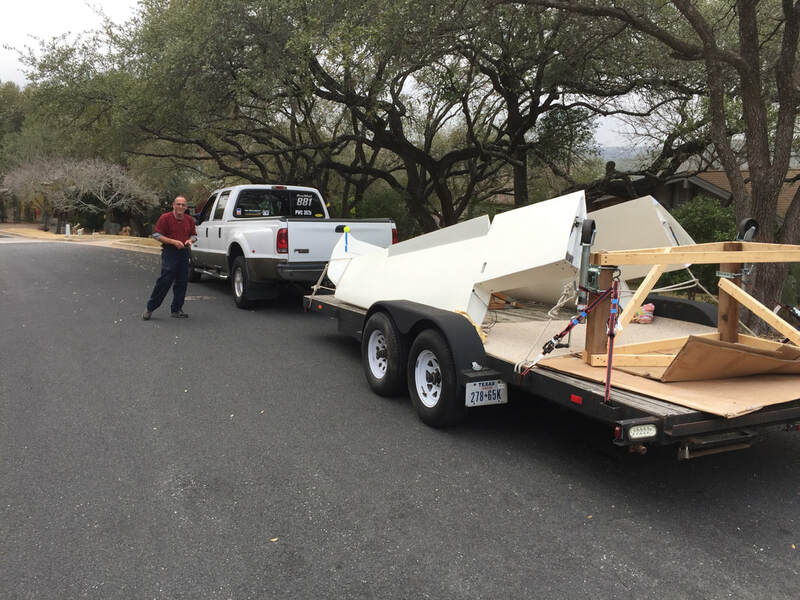 John Nodler brought his friend's flat bed trailer and helped me get the wings and other misc stuff out to the hangar that I won't be using until they get attached to the fuselage. With the first engine start cowlings completed to first coat of primer I had all the large elements done, and felt I could move the remainder of the project to the hangar. I'd occupied the garage for 4 years and kept my wife's car out of her side for 2 years so it would be nice to get this space back. John Nodler again volunteered to help me with the same car hauling trailer we used for the wings. The pictures show how we had it strapped down. No issues what so ever, but we made the trip after dark when traffic had died down and the Harbor Freight towing lights really helped John know where the edges were, as well as alert other vehicles not to get too close. Needless to say it still got plenty of attention. Total drive time was about an hour, not being in any hurry. Aligned and ready to winch onto the trailer. We used a rope "bridle" from the main gear to the winch hook which was just forward of the nose. Winch was nice and slow, but full control, vs pushing it up on the trailer. When the nose gear leg was a couple of inches from the back edge of the trailer, one person held the nose (it's light with the engine on, even with ballast in the nose) while I raised the gear almost all the way (see next picture to right). Strapdown configuration: both gear legs criss crossed to opposite side of trailer tight. Yellow strap in canard slot is just snug. John is doing final adjustment on towing lights (taped around the strake tips). Reece and Jay were super helpful in the loading process. Dianne took pictures and joked with the neighbors. 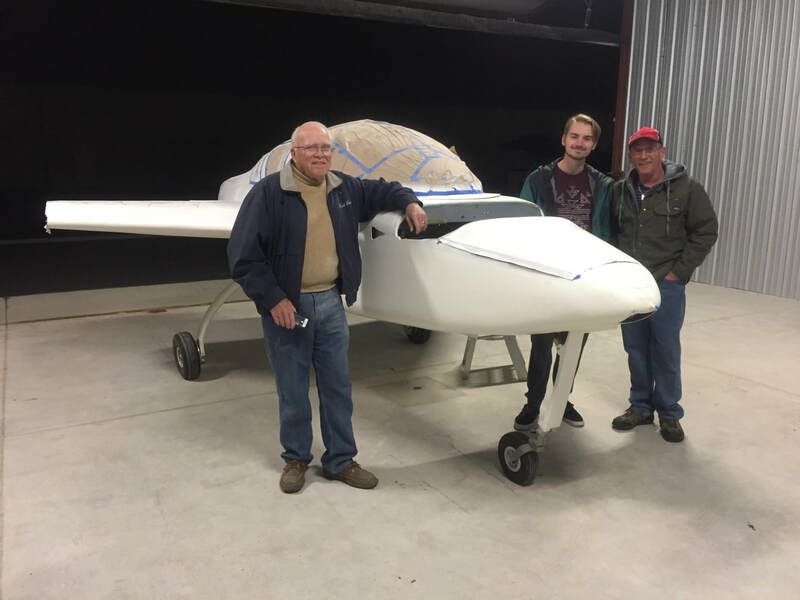 Ben, Reece, and John with the Cozy safely housed in the hangar! and then further winched the plane up the ramps with everything rolling in a nose down stable pose. Then raise the gear all the way and let rub pad smash a small cardboard box. John used a small generator to run the winch, which was strapped in position on the leading edge fo the trailer. Lights working great for the night transport. I'll post more on this over time, but want to at least indicate that meeting the others with hangars at my airport has been both fun and rewarding. These are fun people with a wide variety of aviation interests and it will be fun to grow with them as I get the Cozy airborne, proven, and shared with others.